WRHLI Fellows with the high school Children in Panama. HAMPTON, Va. (June 14, 2018) — Thirteen Hampton University students just returned from a trip of a lifetime to Panama City, Panama, as part of the William R. Harvey Leadership Institute (WRHLI) International Service Learning Program that occurred from May 14 – 23, 2018. 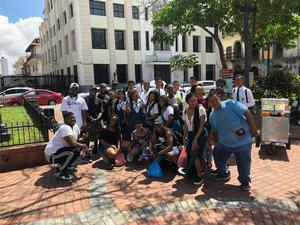 This program launched in 2016 when students traveled to the Dominican Republic for an eight-day international service learning and study abroad experience. Last year, WRHLI Fellows traveled to Costa Rica for a ten-day service learning initiative. Costa Rica provided students with a memorable travel experience, while also allowing them to serve a population, known for its rich ecosystems and remarkable landscapes, which is very different from their own. 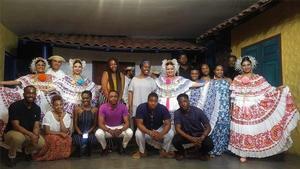 “I feel so blessed that our Fellows are able to participate in this program to help give back and improve the world we live in, by experiencing other cultures and bringing back memories that will last a lifetime,” said Hampton University President Dr. William R. Harvey. WHRLI Fellows applied for the W.D.C. Harvey Scholarship, where finalists went through an interview panel, were selected, and then required to take LEA 305 Leadership Applications of Cultural Intelligence and The Entrepreneurial Mindset, a 2-credit course which met on Friday’s at 7:00 a.m., during the spring 2018 semester. The W.D.C. Harvey Scholars is named after Hampton University President Dr. Harvey’s father, who was a social activist, and a business and community leader. This is the second year of the scholarship. Students participated in three main activities throughout their time in Panama: immersing themselves in the culture and lives of the Embera Indigenous community who live in a village that requires a one-hour long canoe ride to get to; served at a local foodbank and prepared over 12,500 meals for the community; and lastly, visited the San Jose Malambo Orphanage, where students interacted with children ranging in ages infant to high school, helped donate school supplies, and visited classrooms. The 2019 International Service Learning trip is already being planned. The Leadership Fellows will get a chance to apply this September to become a 2018-2019 W.D.C. Harvey Scholar. For more information about this program, go to http://li.hamptonu.edu/intl_service_learning.cfm.